I had originally been planning to go to Solihull Moors v Bishops Stortford tonight, but my mate Anwar couldn't make it. So I looked for something closer to home that I hadn't been to. 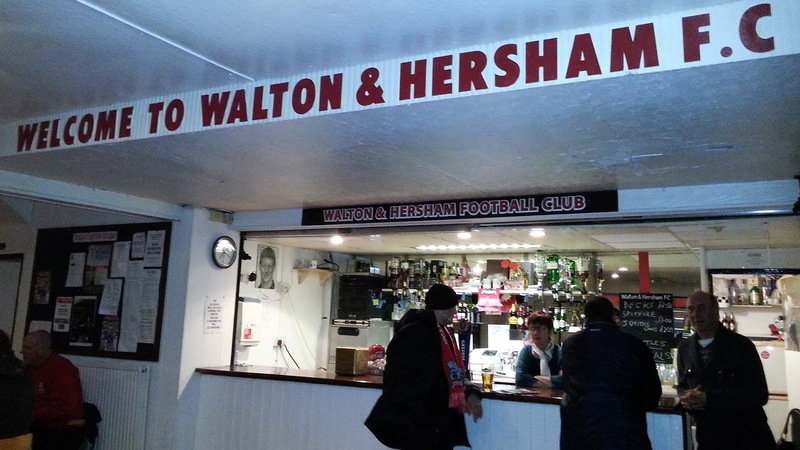 After looking at a few options, the nearest seemed to be Walton and Hersham, a ground that I had been to take pictures about 10 years ago, but had not seen a game at. All my other options were further away or were in meaningless cup competitions, so in the end, this one got the vote. 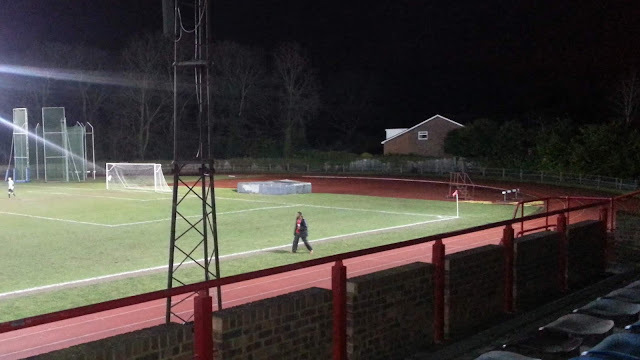 On the day I wasn't feeling my greatest due to conjunctivitis in my eye and was considering not going or going to Uxbridge v Hayes where I knew some of the people attending. But in the end, I managed to motivate myself into getting out of the house, hoping I would be rewarded by a good game. Because of the localness, I could leave later than usual, in the end, after having dinner it was 6.25 before I got going. It was a fairly easy journey, which is no mean feat for a journey that involves the M25. I got to the ground about 7.10 and after easily finding a parking space in the street I went in. 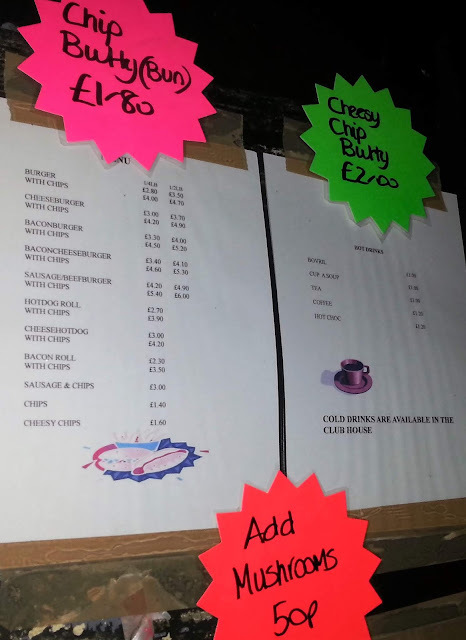 I was still hungry and so went and bought some chips from the tea bar. The bloke in front of me was buying what I thought was a dog a sausage as I half listened to the conversation between him and the staff at the tea bar. But it turned out to be a fox, who had been seen 'several times before' in the ground according to the tea bar lady! There's a first time for everything. 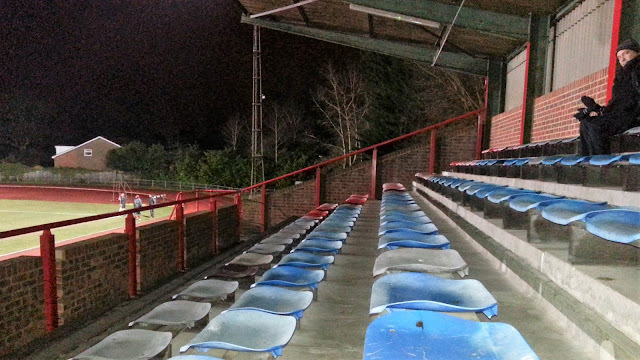 I went around the ground taking pictures and settled for a seat in the main stand. Despite the running track around the pitch, the view was not bad at all. It was a chilly night and with Faversham chasing the playoffs and being unbeaten away from home since August, they were the favourites to win, especially with Walton & Hersham being in the lower reaches of mid-table. But it didn't turn out that way. 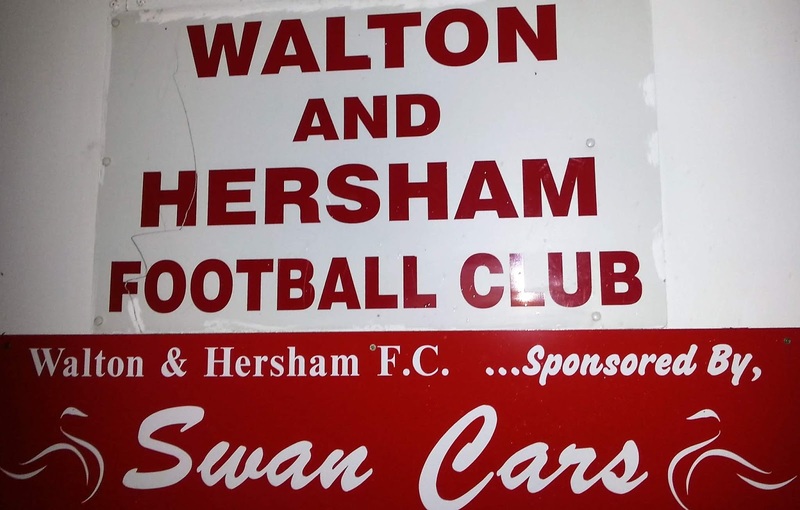 And Walton who had gained one of their 8 victories in the reverse fixture in Kent repeated the dose as they dominated the evening's game, eventually winning 1-0 through a Graeme Purdy penalty after Chris Wales was bought down. The penalty was struck past former Hayes keeper Simon Overland who was the only player I recognised from the lineups tonight. 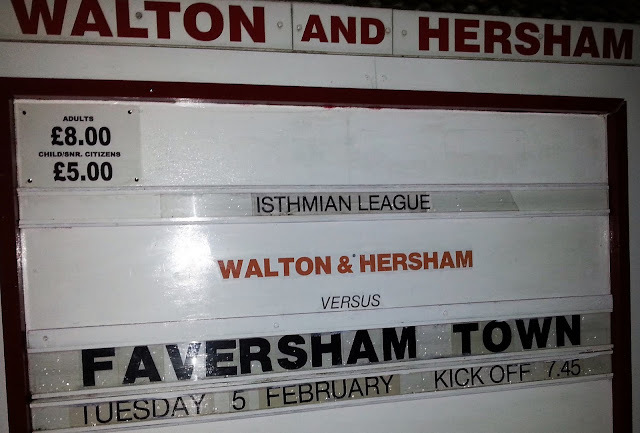 The closest Faversham came was from a free kick struck by Wayne Wilson which whistled just past the post. 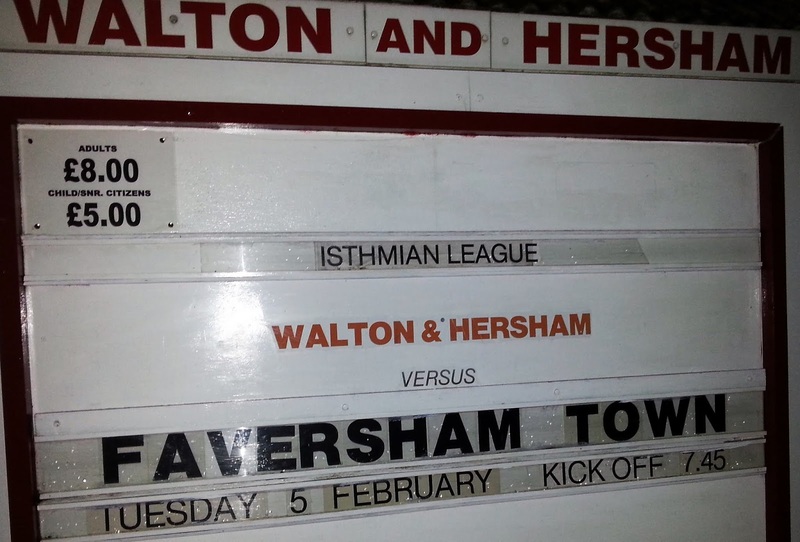 Faversham looked pretty toothless, certainly not the team that their playoff placing suggested. 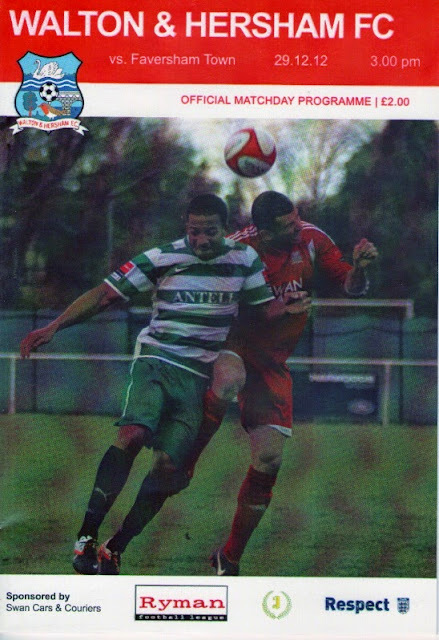 Their best player was probably their number 7, Daniel Lawrence (at least that's what the programme said, no announcements or teamsheets were available) All in all there were 90 people there, pretty much all of them supporting the home team. The match didn't end till nearly 9.50 and with an even easier journey home, during which I listened to an interesting piece about Bobby Moore, I was home at 10.30. 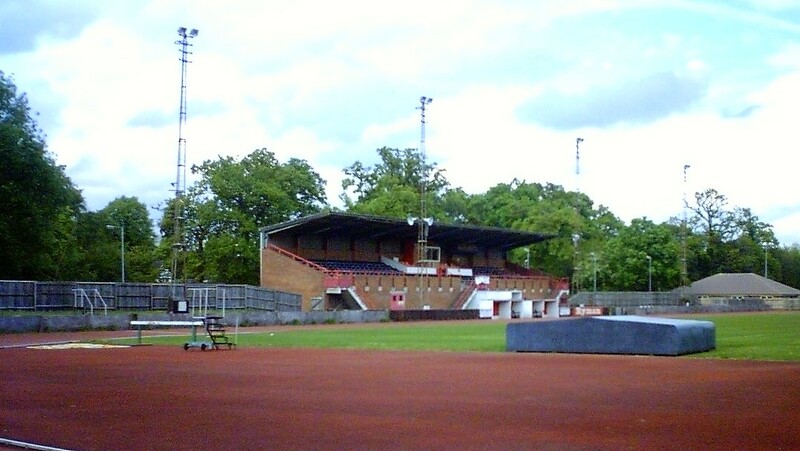 STOMPOND LANE is another ground with a running track, but for one side at least, things are not as bad as at other grounds. The side as you go in is fairly close to the pitch and the big stand behind which holds around 450 offers great views from an elevated position. To either side of this, there is open standing which could hold up to 500 I guess, even though it's little more than grass banking. To the goal behind the left, there is terracing that would hold around another 500, though this is pretty useless as the view from there is terrible due to the distance from the pitch, whilst at the other end is little more than a walkway, but could hold about 100 at a push. 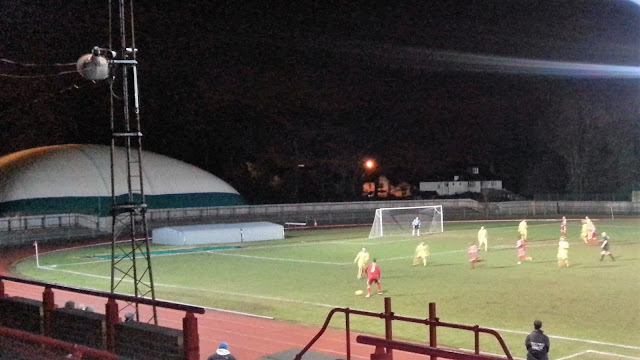 The final stand, a large covered terrace which runs the length of the pitch, seemed to be set back a little further from the pitch than the seated side. This could hold around 1500. Despite all this, ground capacity is capped at 2000, though that isn't likely to be a problem unless they get a big cup game. There is a small bar that serves a limited selection of drinks and you can also buy club souvenirs from here. The tea bar meanwhile is very good considering the small crowds they get, with a pretty wide selection at reasonable prices.